Montreal, December 5, 2018 – Quebec Precious Metals Corporation (TSX.V: CJC, FSE: YXEN, OTC-BB: CJCFF) (“QPM” or the “Company”) is pleased to announce very encouraging results obtained from the soil sampling program that was carried out during the fall. 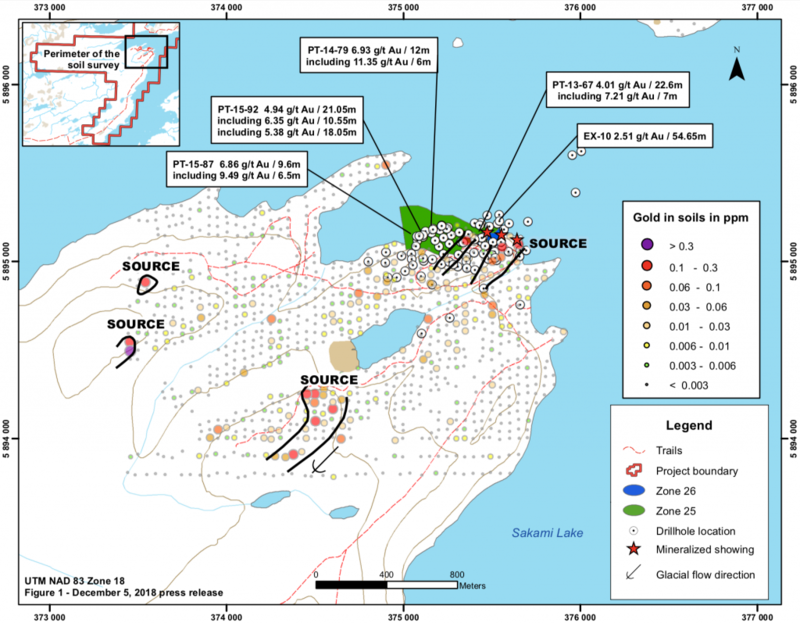 This survey covered an area west of the La Pointe gold deposit area located on the Sakami project (the “Project”). These results confirm the extension of the Sakami prospective trend over a distance of approximately 2 km (see Figures 1, 2 and 3 attached). Strong and large coincidental gold and arsenic anomalies comprising of values significantly above the geochemical background level have been identified in soils (B horizon) on the Project. The anomalies remain open to the southwest and especially to the west-southwest. In most cases, mineralization previously recognized by prospecting, trenching and drilling show a spatial correlation with the soil anomalies. This is documented as well for the Éléonore gold deposit (operated by Goldcorp Inc.). The soil anomalies suggest the presence of three (3) source areas that could represent an important mineralized system in the bedrock. These source areas, which have not yet been tested by drilling, stands out as part of the broad Sakami prospective trend with potential for near-surface discoveries. The Project remains largely under-explored. A total of 954 soil samples were collected for gold and indicator elements to test the possible presence of an extension of the La Pointe deposit to the west. A drilling program consisting of a minimum of 3,000 m was announced by the Company on October 29 on the La Pointe deposit. This program is currently underway and is progressing well. Quality assurance and quality control procedures were implemented to ensure best practices in sampling and analysis of the soil samples. The samples were delivered, in secure tagged bags, directly to the ALS Minerals laboratory facility in Val-d’Or, Quebec. All samples are analyzed by aqua regia extraction with an inductively coupled plasma finish coupled with atomic emission spectroscopy (ICP-AES). The field work was under the supervision of Jean-Sébastien Lavallée (OGQ #773), Vice-President Exploration and director of the Company. Normand Champigny, Ing., President and Chief Executive Officer, and Jean-Sébastien Lavallée, both Qualified Persons under NI 43- 101 on standards of disclosure for mineral projects, have prepared and approved the technical content of this release. QPM is a new gold explorer with a large land position in the highly-prospective Eeyou Istchee James Bay region, Quebec, near Goldcorp’s Éléonore gold mine. QPM’s flagship project is the Sakami project with significant gold grades and well-defined drill-ready targets. QPM’s goal is to swiftly explore this project in order to advance it to the mineral resource estimate stage.